Here is a new quilt finish, Pink. The pattern is called Lightning and it is from my friend Christa Watson's new book, Machine Quilting With Style. Today is my stop on the blog hop for this great new book. You can read the story behind this pattern over at Christa Quilts today - go here. I was very excited to be included in Christa's blog hop. Christa and I have become internet friends and we even got to meet in person at Quilt Market and at QuiltCon. She loves machine quilting, and you know I love machine quilting, she wants to encourage more people to show modern quilts at quilt shows, and so do I, well, you get the picture, she is a kindred quilty spirit. Christa asked many of the participants in the blog hop to make one of the quilt patterns in the book and I chose the pattern called Lightning. I have never made a rail fence quilt, and Christa's modern twist on this traditional pattern caught my eye. My version is about 60" square, the pattern in the book includes instructions for a full bed size version. Although the book has a number of lovely modern quilt patterns, I especially loved the parts that focus on the quilting. For my quilt, I used two colours of thread, a light pink for the stipple/meander quilting on the pink parts and a soft grey for the lightning bolts. Both my choices were Superior Threads King Tut 50wt cotton threads. I love how the colours add just a little extra to the quilt. 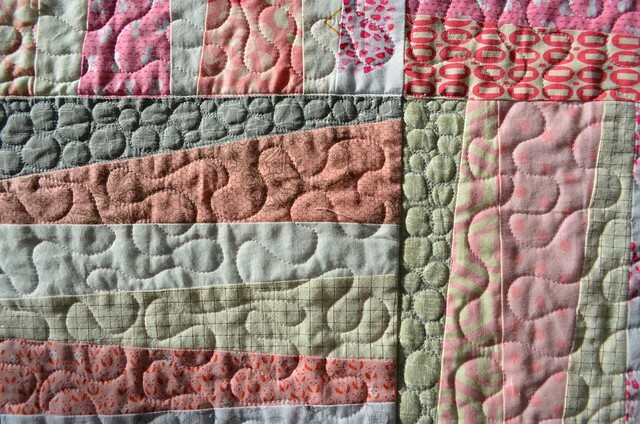 As you can see, I used a stipple/meander quilting pattern for all the pink areas, just as Christa suggests in the book. Originally I thought I would change the quilting for each stepped diagonal part of pink but I was having such a great time stippling that I decided to stick with it. I took some photos in harsher light to purposely show off the quilting more. You can see that I decided to try a number of the other quilting patterns Christa features in Machine Quilting With Style in the grey lighting bolts. I used switchbacks - a design that I use often and love. Pebbles, a design I love but seldom use as they are time consuming. But I love they way pebbles look and realize I want to use them more. I used boxes - a square meander - which is another favourite quilting motif of mine. Of course I used parallel lines, perhaps my very favourite quilting motif of all. I did my best to give the quilt an overall balance of quilting density. The lightning bolt areas are a bit denser but not extremely so. Christa shares a number of excellent tips for walking foot and free motion quilting in the book. A reader could easily work through the patterns and the quilting motif and become a proficient quilter by the end. I wanted to mention that I quilted Pink on my long arm quilting machine, not my domestic machine. I was able to easily use all the quilting motifs and I think my quilting is much like that done on the home machine for these patterns. My only challenge on the long arm was working diagonally down the quilt - there was a fair bit of advancing and then returning the quilt to the earlier position to begin again. I had not done that before and I learned that it was no big deal to do so. 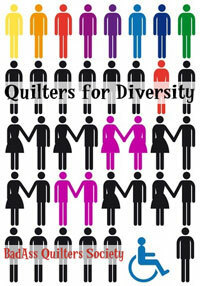 All in all, Christa's book is, in my view, useful for most every quilter. I pieced my back with some of my favourite Laura Gunn prints. I have been saving her painterly prints and was happy to see how well they worked with this quilt top. As I used the same pink and grey thread in the bobbin, you can see how the lightning bolts stand out on the back of the quilt too. All of the photos in this post are before the quilt was washed. I have since washed her and may add a photo of it washed later. But since the book is about quilting, the better photos of quilting are before the wash induced crinkle happens. I bound this quilt with this lovely Maker print. I was originally thinking of a scrappy pink binding but I am glad I went with this one print instead. It seems to gently hold all the scrappy riot in the quilt. I have to say that I am likely to make more quilts using Christa's pattern and her quilting tips as a starting point. You can get a copy of Machine Quilting With Style on Amazon here. I have an electronic copy of this fantastic book to give away as part of the blog hop too. To enter, leave me just one comment. Let me know if you are a confident quilter - as opposed to piecer - and if you like the quilting part. I will randomly draw the winner at 6 am MST (first thing) on Saturday morning. 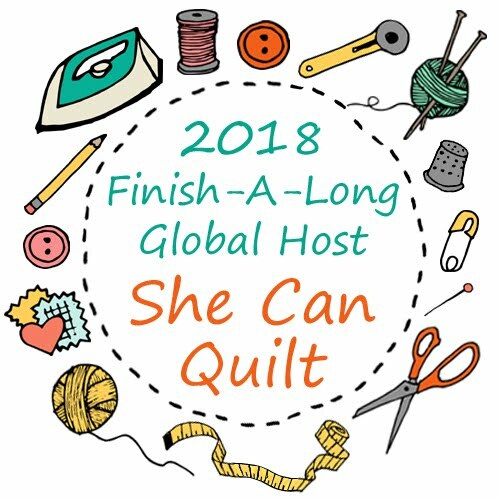 Christa is going to host a quilt along and you can help her chose which pattern from the book to use by competing the survey here. And here is the full blog hop schedule - there are many inspiring posts along the way for you to check out. I have truly enjoyed Machine Quilting With Style and I expect you would too. And Pink, well she is just so pretty, I am loving her too. Besides entering my giveaway for an electronic copy of Christa's book by commenting on today's post, head over to Christa Quilts for links to a couple of other giveaways too. And several of the blog hop stops also include giveaways too, in addition to inspiration. Edited: My giveaway is now closed. Pink was also on my Q4 Finish Along list! Love your pink version of Lightning! All the different styles of quilting gives the quilt life, and makes it very interesting! I am fairly new with FMQ, but getting more and more comfortable with quilting. I like how the quilting can transform and enhance a quilt design. I would say I am a confident quilter on my smaller sized quilts as I find it easier to do on my DSM. I love pebbles and I find doing this motif very relaxing as well as matchstick quilting. this quilt is gorgeous!! i love this version of a rail quilt (the first i ever made!) and love the grey with the pink!! i am much more confident at making a quilt top than quilting one... i've had tension issues with my rather expensive janome that make me less than confident about quilting! I am a more confident piecer than quilter, but my quilting is getting better. I know it's all about practice, I just need to take the time. I did step out of my quilting comfort zone on a small quilt I made last week. There was a fair amount of un-quilting involved, but in the end I'm pleased with how it turned out. 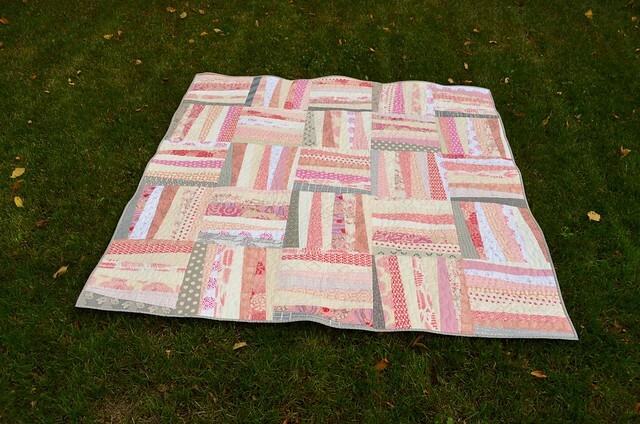 Such a gorgeous quilt, Leanne. Love the colors and all the different quilting you did. Wow, your quilt is stunning!! Love your quilting designs. I am very new to FMQ and don't have a long arm machine. Hopefully, I will be able to get one some day. Pink and grey - one of my favourite colour combinations! This is just gorgeous! To be honest, at the moment, I don't really like the quilting part as I keep having issues with it! Hope to love it one day! This quilt is so pretty. I love the choice of the pinks with the grey. I would love to win a copy of this book. I am not a confident quilter but I just bought a new Bernina sewing machine with more room to do the quilting and a stitch regulator so I'm primed to try more and get better at it. I love piecing and really want to get better at quilting. This book is so beautiful and would be perfect for improving in that area. I like the colors you used for this - it's really soft looking. This a great version of Christa's quilt. I feel after all the years of quilting I'm very experienced. I like all steps in the process, design, piecing and quilting. It is still challenging to become better and learn new techniques. I am a confident beginner at piecing and quilting! My FMQ is improving but I have a long way to go. I would love to win a copy of the book! I love quilting, but I don't always feel super confident about it. I have found that advancing a quilt on my long arm and then going back isn't nearly as scary as I thought it would be, either. I have even loaded a quilt, done half the quilting, and then unloaded it to reload it rotated 90 degrees and it worked beautifully. Pebbles are time consuming, but I find that I just love the texture of them and am always happy I used them... once it is done. I enjoy piecing but the quilt really comes together with quilting. I'm still working on my free motion skills. I love your pink/grey version. and the back is just too fun. I am a confident beginner. quilter. I love to paper piece and piece in that order. I am working on FBQ so for now am doing straight lines and having a blast. I am a beginner, so I am not confident with quilting. I tied one quilt and am hand-quilting my second quilt. I am not a confident quilter yet, but I am a confident try-er :) and my work is starting to improve! Love the quilt you made. To answer the question am I a confident quilter or a piecer, I think I fall somewhere in between the 2. Confident at quilting, not yet, but creating the quilt tops and backs I'm confident at that. Your version is lovely in pink and grey! I am getting more confident in my quilting. I quilt all my own quilts and do quite a bit of FMQ and I really do like both piecing and quilting. Sometimes I have a hard time figuring out what to use as my quilting design. I'm a confident quilter, but like piecing better. I am a confident quilter and own the Handi-quilter Avante long arm. Love it. Beginning quilter, so not confident yet, but intend to get there..... Love your quilt! I'm confident with straight line quilting. Working toward becoming so with FMQ. I love your pink quilt! Fantastic back too! I am a very confident piecer, but very hesitant quilter. I am willing to learn, and I think this book would help me. 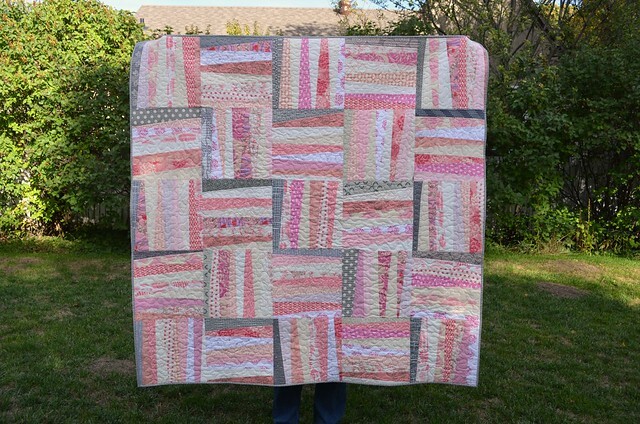 I love the pink lighting quilt, you have done a great job quilting it and showing what it looks like. I am nervous about doing my own quilting. Wow is that quilt stunning (even in its subtleness) - I just LOVE it!!! I am more confident as a piecer but I always quilt my own quilts. My skills and confidence in the quilting are growing with practice. I am very confident in my designing and piecing skills but do not enjoy the quilting part. Guess I need more practice but I'd much rather be doing the designing. I'm a confident quilter and have only once sent a quilt out for machine quilting as it was so large, over 100 inches a side. I love piecing quilts, but am a beginner at machine quilting. I know that it takes practice, practice, practice. This looks like a wonderful book. Thank you for participating. I am a confident piecer but can't seem to get the hang of free motion quilting. I feel fairly confident doing straight line quilting, but that's about it. I'm thinking Christa's book would help! I am not a confident quilter! I am just working up my courage to quilt my own, but it is getting better! The hard part is knowing what to put in all those spaces!! Not a confident quilter but I do enjoy it and want to do more! I am a novice quilter, and really enjoying the process of learning to quilt. It's fun! This is a lovely and fun quilt! Thank you for the many pictures! I am an experienced quilter and prefer piecing to quilting. I like to quilt small surfaces, but the bigger quilts go to the longarm master, my friend Soile for quilting. What fun! How creative to use such different colors - but still honor the original design! 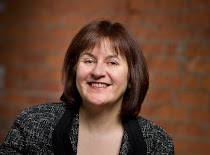 I enjoyed reading about your thinking and process for this project - have added my name to your list to receive your updates. Thank you for the chance to get e-copy of Christa's book! well, I'm a much more confident piecer than quilter. I struggle with FMQ still, and am always afraid that I could ruin my dedicated piecing. Need to overcome this for sure. I think I'm a pretty confident quilter in that I'm willing to try different things and see what works or doesn't work :) I definitely have room for improvement though. Piecing is more my forte but I have quilted some of my quilts on my home machine using both straight line and free motion quilting. I have also rented time on a longarm machine and done free motion and I found it to be easier. I suppose the montra 'practice, practice, practice' definitely fits here as I enjoyed it but still don't feel so confident about doing it! Thanks! Love your quilt! I would say that I am a confident quilter. Most of my quilting has been on lap size or smaller, but I am working my way up to larger ones. 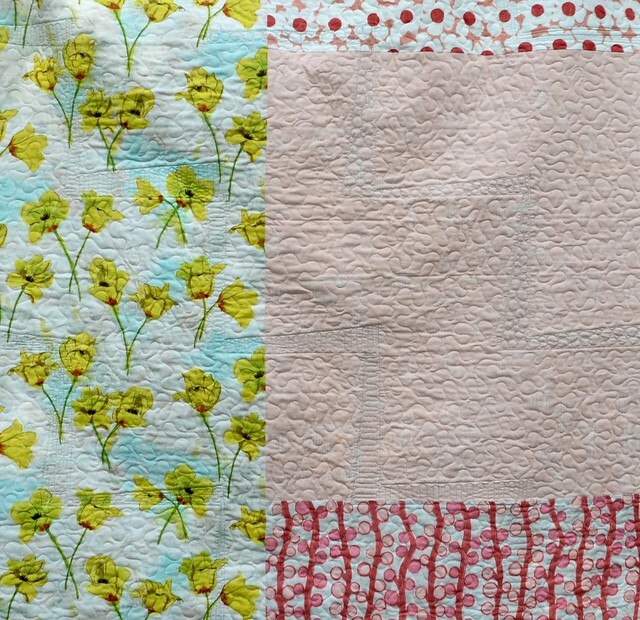 Your quilt is so pretty and the quilting really enhances the design--love it. I would say I am semi-confident when it comes to quilting. I have not conquered free motion quilting yet-- still working on it. I am using freezer paper motifs and find they work well for me. I also quilt with my walking foot in wavy lines. I have a lot of black and white fabric so have put Christa's quilt on my to do list. I love the pink and grey color combo! Great fabric choices! I love to piece the quilt and need to work on my quilting skills. I usually don't quilt large quilts on my home machine but maybe I will try again. Confident art quilter on a smaller set-up mid long arm....hope to buy new smaller machine for some non- long arm work. Your quilt is awesome., the quilting is brilliant! I'm confident with my Bernina and straight quilting...love the walking foot. I love FMQ but not as confident. I need her book! I am a somewhat confident quilter, but I do "forge ahead" which eventually builds confidence. 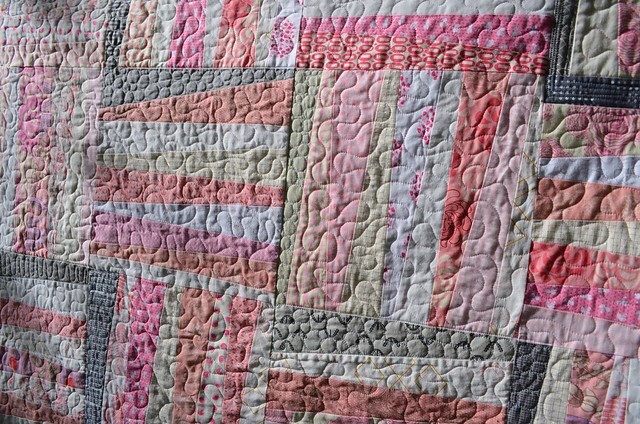 Pink and grey is nice together in this quilt. I actually enjoy the quilting process, so would have to say I feel like a confident quilter. Having said that, there is always more to learn and new designs to try and add to my skills. Christa's book sounds fantastic. I would describe myself as a 'not very confident' quilter!! Very confident piecer, mostly confident quilter but I have lots of room for improvement. Lovely quilt, Leanne! The grey adds a lot to the overall design and your quilting is - as always - lovely. I love your quilt. I do enjoy piecing more than quilting. I quilt on my domestic and embroidery machines. I am not a very confident quilter. I've mostly done pantographs on my longarm up to now, but really want to branch off into custom designs. Thanks for the chance to win! Have to say other than straight line quilting I am not a confident quilter. I have always loved pink and gray together. I would say I'm a confident quilter. I love the quilting part once I've decided on a design. That seems to be the hardest part. Thanks for sharing your beautiful quilt and for the giveaway. I'm new to the quilting process. I find piecing goes much better and I love seeing the pattern develop. I'd like to be a better quilter so it would be wonderful to win the book for my Kindle Fire. It sounds pretty wonderful. I've been a confident 'quilter' for over 50 years. I am very precise :( and really really want to release the inner warrior and get going on FMQ - I'm ready and I respect your support of this book. It sounds just perfect for me - I trust you. Thanks for the opportunity! I love this quilt, and really enjoyed reading about the details of the quilting. I'm not a confident quilter at all. If love a copy of this book. I need all the help I can get! I'm more confident with piecing, but my confidence with quilting decreases as the size of a quilt increases. I love the piecing as I have a small sewing machine. I am planning to buy a larger one for quilting but on a senior budget must choose carefully. I am planning to make a pink Bargello quilt for my daughter it has been great fun trying to find 20 shades of PINK. I'm a very confident piecer but still a little intimidated when it comes to free motion machine quilting a full size quilt. I would consider myself a quilter approaching the confident level. I love the entire process of quilting so I have a hard time letting someone else quilt my quilts. 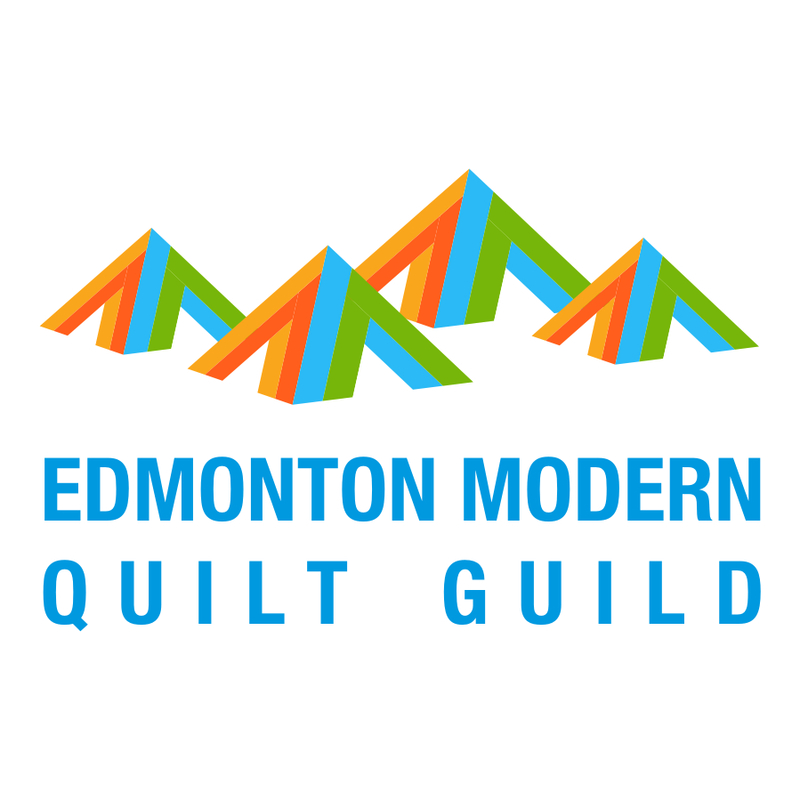 I hand quilt, use the walking foot, use the free motion foot and sometimes do a combination of all of them on one quilt. I am very confident with hand quilting and walking foot quilting and am working hard to improve my free motion. Your pink version is lovely. I am a confident quilter(most of the time), and have been making and quilting my own quilts from the beginning(over 30 years). I really enjoy all the stages. I am a confident quilter with my walking foot, and I've found I can do quite a bit with it. 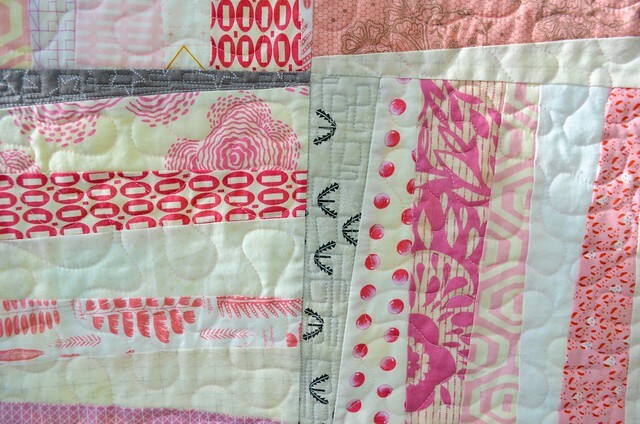 I love your Pink quilt and enjoyed looking closely at your quilting as I read all the details about it! Thanks for a chance to win Christa's book! I love pink. I love the grey bits that high light the pink. I would call myself a semi confident quilter. Lol I am not a confident anything. I just started quilting 3 years ago and have 8 quilts. By made I mean both the piecing and the quilting. I love it all, with the exception of making the quilt sandwich. That I hate. Great blog! I'm getting more confident about quilting. I enjoy piecing and am trying a few artsy quilts. My quilting is done on my home machine. Piecing is my forte at this point. Most of my quilting has been very basic, using a walking foot. I need to break down and make some practice "sandwiches" and give FMQ more of a chance. I think Christa's new book would be a big help to me. Thanks for the giveaway opportunity. It's great to see what you did with Lightning, Leanne. Very well done! 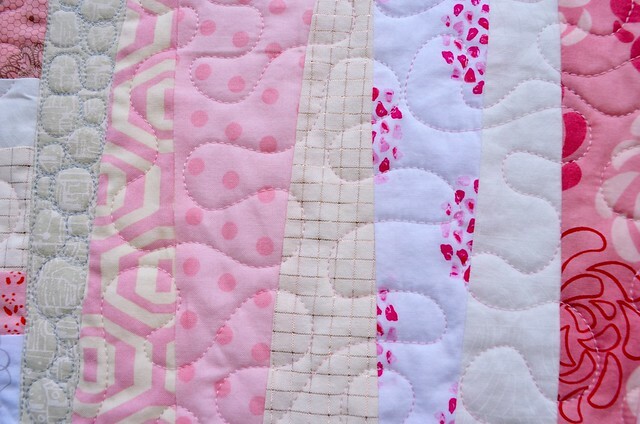 You've quilted a nice assortment of different designs. Just wanted to see what you were up to... please don't enter me in the giveaway. Love to see all the various quilts with such imaginative quilting. Thanks for the giveaway. I am a beginning quilter and want to read and practice a lot so I can be a confident quilter (not just a piecer). I am a confident piece but getting better at quilting. Practice makes perfect. 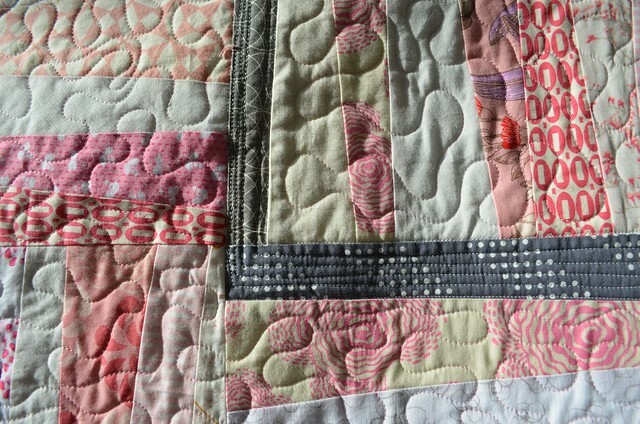 I really enjoyed seeing how you changed up the quilting on "lightening " gray. I'm very new to the quilting piece but keep practicing. I am enjoying the whole process and everyday I learn. I love it. I am a more confident piecer than quilter, but my quilting is getting better. Love your pink version, very beautiful. Love your version of this quilt. These are some of my favorite colors. I am comfortable machine quilting, but only moderately so with free-motion. Your "Pink" turned out beautifully! Nice that you figured out how adaptable your long-arm is! I would really like to check out this book as I am trying to learn as much as I can. 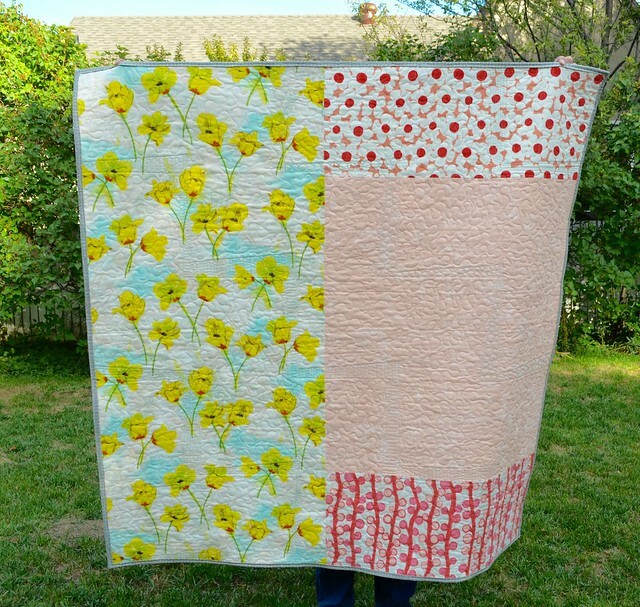 Love the way your quilt turned out! I'm still very much a novice quilter, and it's not my favorite part of the process, though I'm learning to like it more. 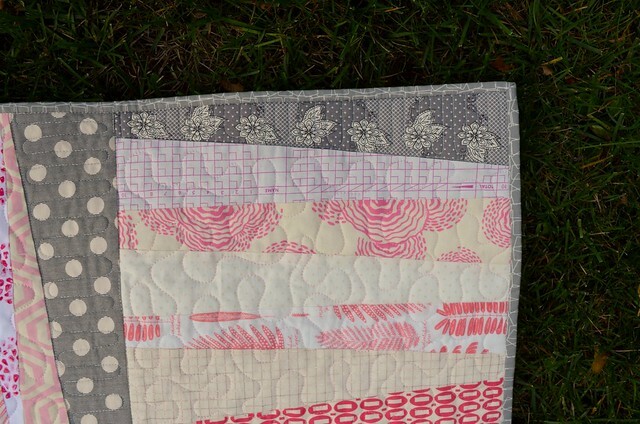 I was surprised at how soft this colour palette is compared to Christa's more graphic quilt. I like quilting but I am not confident yet. However I currently have 3 pillow covers lined up for my next sewing break so I will be getting some more practice in. I need to practice my quilting more and I have plenty of projects waiting to be quilted! I love the piecing aspect but I have never done my own quilting. I want to but every instructional I have read leave me lacking. I think Christas book may be a game changer! Hope I win!! I enjoy piecing but lack confidence in the quilting. Thanks for the opportunity. Love how your lightening bolts stand out! Like you, I have a longarm and love custom quilting on it! My quilting is infinitely better then my piecing!!! I need to try more improve piecing...not needing to match seams and keep points works for me. I can't tell you how many headless geese and pointless stars I have made!!! I'm a so, so much better pieces than quilter! All because I hardly ever quilt any of my quilts. When I was just starting out, I hand-quilted every one of my quilts, but I didn't do a very nice job of that either, using the stabbing method rather than rocking the needle as the real quilters do. It looked OK on the top but horrible on the back! I would like to get a bit better at machine quilting with the walking foot. I am not a great machine quilter. But I do like to quilt my own quilts on my domestic sewing machine. I do a lot with my walking foot. I am a not so confident quilter. Not too bad with smallish quilts, baby quilts, etc, but terrified when they are bigger. I'm currently agonizing over starting one. Would love Christa's book to work through till I feel confident. I am mystified by machine quilting! Would love to learn more. 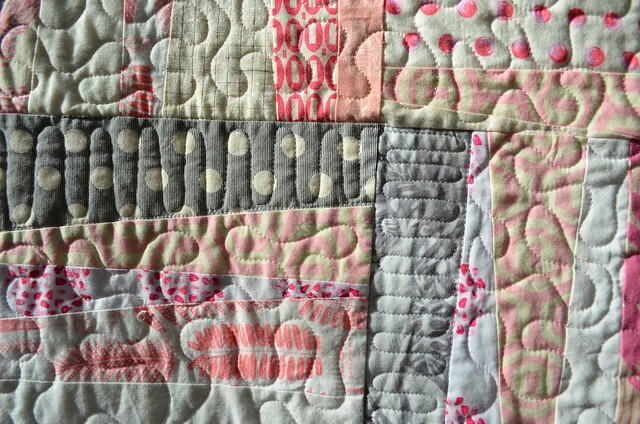 I love the pink/gray combo and the quilting sure makes the quilt pop! I always want to learn more about the quilting process. I think no matter how long you've been quilting, you can still learn more from another perspective. Thanks for the great post and giveaway. I'm a confident quilter. I would love to win! I am a Happy Piecer, who quilts all of her own quilts. I wouldnt say I am confident but I do give everything a go. I'm getting to enjoy the quilting more and more. Your lightning quilt is very pretty and I would love to win Christa's book! I enjoy quilting and am getting better at it on my regular machine but would like to become more creative in selecting and applying quilting designs. 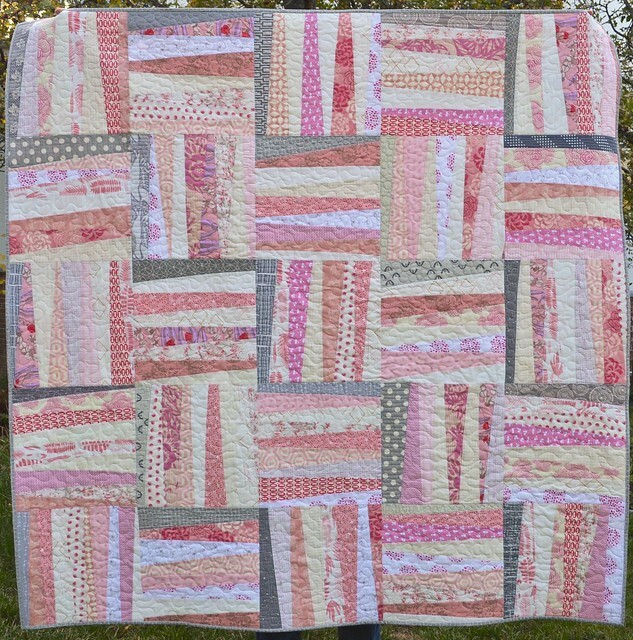 Pink is a lovely quilt! I seem to get less confident as time goes by! I struggle with managing a large quilt.never seem to improve. maybe this book will help! I am definitely more confident piecing than quilting, but I still do my own quilting. Some quilting patterns I like more than others, generally the ones I like the best are just all over the quilt with no stopping to follow the piecing. When I can do that, I do enjoy the quilting. 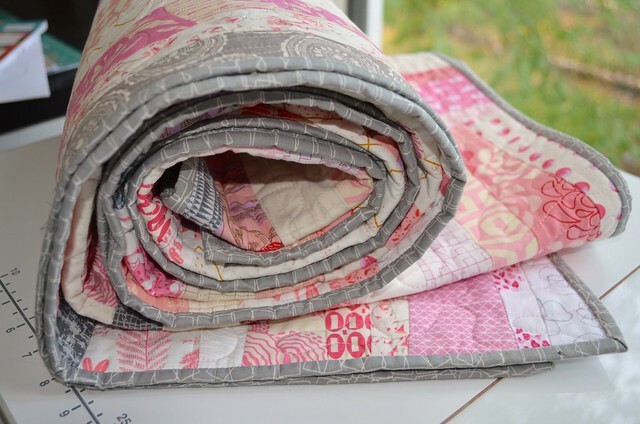 I am a confident pricier but I quilt a mean meander on my juki! Love your quilt! Thanks for the giveaway. I am self-confident... But I enjoy it! September Scraptastic Tuesday Link up is open!